It looks like Google's Street View will soon be expanding to even more places than it already covers. 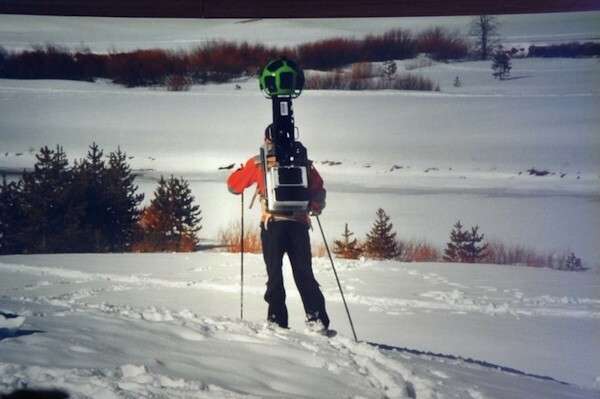 The company has today taken the wraps off a brand new capture tool it's dubbed the Street View Trekker, which can be worn on a person's back in order to map and photograph areas that are too difficult for even a bicycle or snowmobile to reach. Naturally, it's Android-powered, and it packs two batteries that Google says will last a full day -- although its 40-pound weight will likely necessitate a few breaks during that time. No word on when we'll see the first results from it, but Google intends to take to National Parks, the Grand Canyon, castles, ruins, and more -- even the ski slopes, as seen in another picture after the break. Update: We just spoke with Luc Vincent more in-depth about the new backpack, and what we learned is after the break. We just spoke with Luc Vincent after the event to learn a bit more about the backpack, and we discovered some pretty fascinating nuggets. For one, it took around a year to build, relying on a low-power computer with Android onboard and an application that does little more than "start and stop recording." It taps into 15 five-megapixel cameras up top, with all of the imagery being captured locally to a hard drive. From there, it's brought back to Google, stitched and analyzed, before being uploaded to the web. It's also working to make the backpack smarter; it'll eventually analyze one's gait, and if it senses unusual vibrations, you'll be able to select the capture frequency to get higher-quality images. Also, it's absolutely not designed for indoor use -- "the images would be too blurry," Luc said. For now, Googlers will start out by testing the hardware, and once the kinks are worked out, Google may reach out to partners, or even rent them out. For instance, if a university wanted to map a new courtyard, they could rent one for a day and do just that. Pretty swank. We also casually mentioned the idea of offering them in different colors, and Luc chuckled -- "We're thinking about that!"